The formal aspect of the Stradivari homage expresses its conceptual origin. 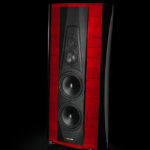 It is shaped like two facing lutes: a further development of the construction criterion of Sonus faber loudspeakers. However, the “soul” of Stradivari is also reminescent of the construction principles of stringed instrument making, because inside it houses a linking element that unites the two walls, just like the joined plates of a violin. The exclusive cabinet features curved walls. The density of the wood employed to make the walls, the quality and the direction of the fibres have been carefully researched to distribute and control resonance. SYSTEM 3 way floorstanding vented box loudspeaker. 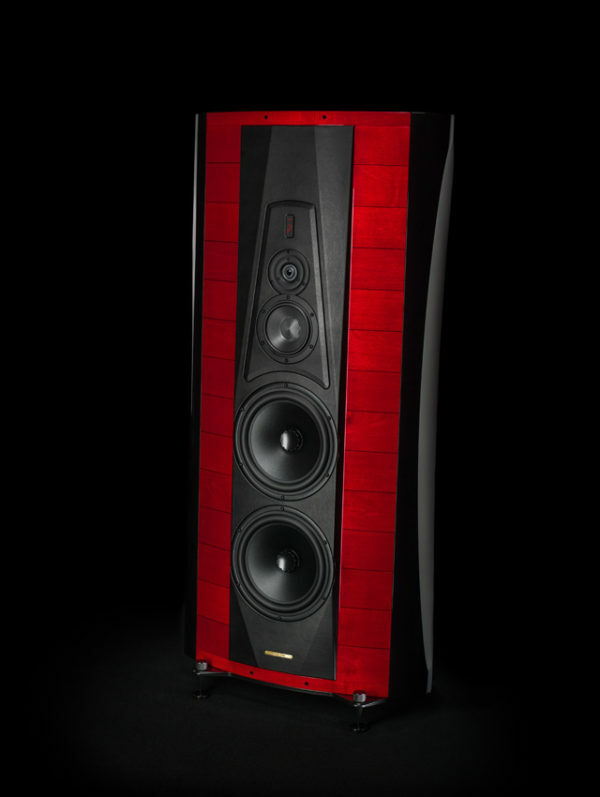 CABINET Elliptical shape design, multilayer, constrained-mode damping, enclosure formed using hand selected wood layers, quality graded and oriented for carefully optimized resonances control.Sub-structural ribs are strategically placed for absolute rejection of spurious vibrations. TWEETER 33 mm ultra dynamic linearity neodymium ring radiator driver, with dual toroidal wave-guide.Natural wood acoustic labyrinth rear chamber, with mechanical anti-resonator synergycally designed and integrated “acoustic ambient”. MIDRANGE 150 mm ultra dynamic linearity driver.CCAW/Kapton “eddy current free” voice coil.Dynamically linear magnetic field motor incorporating Kellog and Faraday rings.All moving elements optimally ventilated for “resonance free” response.Designed synergistically with its vented “acoustic chamber”. WOOFERS 260 mm lightweight Aluminium/Magnesium alloy cone driver in an acoustically amorphous vented chamber.A dual Faraday copper ring long-throw motor system with a 2” “eddy current free” voice coil is implemented for an ultra dynamic performance and linearity.Special coaxial anti-compressors are used, designed to remove cavity resonance and distortions. CROSS-OVER Special multi slope structure with optimized phase/amplitude response. The impedance at low frequencies is controlled for a clear amplifier friendly performance.A unique structured precious metal alloy conductors used, totally coherent on the entire signal path. Cross-over points 300 Hz - 4.000 Hz. FREQUENCY RESPONSE 22 Hz - 40.000 Hz, tuning ports included. SENSITIVITY 92 dB SPL (2,83 V/1m). NOMINAL IMPEDANCE 4 ohm. POWER HANDLING 30W - 300W, without clipping. DIMENSIONS 1370 x 655 x 500 mm (HxWxD). WEIGHT 151.8 Kg per pair – net weight 198.6 Kg per pair – shipping weight.